now what can you do with them you ask? 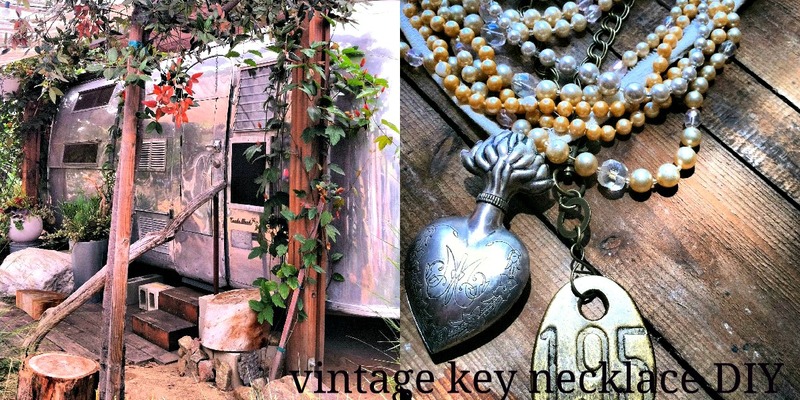 turn them into some wonderful one of a kind accessories! or tag or drop or whatever treasure you've found. you just finished your one of a kind treasure necklace! can used for all sorts of one of a kind accessories! Thank you for the how-to. I have never made any jewelry before but often have thought about it. What I really want to know about is that great Airstream trailer. It's yours, correct? I think I recall you posting about it before. It's so, so cool and so southern California! I love it. Adrienne, you of all people should make some jewelry...it's creative, you get to wear the piece and you can have a one of a kind piece for a fraction of what mass retailers charge! I'm rooting for you my dear...I would love to see you explore this arena! Wo do have a fabulous Airstream, but this one has a permanent home in the uber cool retail collection at the camp in Costa Mesa. I love all Airstreams and photograph them when ever I see them. this one is actually a store that sells plants by day. I took this photo from an upcoming post about the 'camp'. You have one? Oh you lucky, lucky, duck! thank you Megan...I'd love to see your fashionable hand at this! I love "how-to" posts like these, especially when they are detailed enough, and simple enough that I think I may actually be able to do this! I have a couple of necklaces that need to be repaired, and I'm thinking I should just go buy myself my own flat nosed pliers and jump rings and do it myself. Sigh, I love an Airstream!!! Yes you should my dear! With the right inexpensive tools it's so easy! Loved the book you shared :) !! Hey Lovely!! Loving this post!! I have recently repaired several pieces of jewelry with my pliers/rings/lobster claw clasps and thought, I need to do more of this!! This is a fabulous tutorial and it truly is simple to create wonderful, meaningful pieces as you say. So, the Airstream? Yours? Gorgeous flowers all around?!! One of my sisters (I have two) lived in an Airstream trailer for a number of years in southern Oregon. This is the same sister who, at the age of 64, goes backpacking by herself for weeks on her vacation and goes swimming with the dolphins in Hawaii. I'm in awe. I suspect that you, my glamping friend, understands my need for creature comforts. Some of us (like me!!!) are just not cut out for survival backpacking. I love your version of the Airstream. I would love to see the outcome of your jewelry making! The possibilities are endless. Right now I am obsessed with vintage brooches...and giving them new life! Your sister sounds like an eextraordinary woman, just like you my dear! Thanks for this tutorial. I have the keys from the lock my husband and I put on the Pont Des Arts bridge in Paris and I have been thinking of making them into a necklace! Oh you must! What a romantic and personal piece they would make! I would love to see them! Oh I love this, I could never do it, but I have a thing for numbers and old keys. My only goal now in life? To spend a night in an airstream, I just love them so so much. Well Tabitha, next time your out, look me up! Ours is a modern version with all the comforts of home and the charm of vintage! I've never made jewelry, but I'm sure somehow this technique could be incorporated into trim for a hat or a headwrap. I can see the possibilities! Lovely photos, as always. Yes Judith, this simple process could come in very handy with embellishing anything! Oh you should!!! it is quick fun...i would love to see what your artistic vision comes up with! brilliant, I love the bronzie look! and if that is really the front of your airstream, I am freeeeeeeeaking out. Thanks for visiting...i very much enjoyed viewing your offerings.